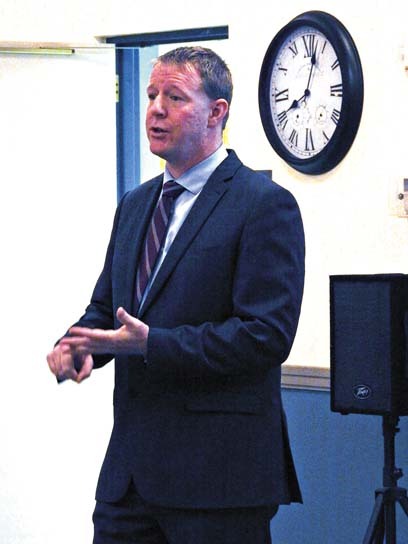 Garrett Neese/Daily Mining Gazette Brian Donnelly, president of the Keweenaw Chamber of Commerce, discusses the year’s activities during its annual meeting Tuesday in Houghton. HOUGHTON — Keweenaw Chamber of Commerce members reviewed the past year’s accomplishments, and treated them to a preview of something to come, at the Chamber’s annual breakfast meeting Tuesday at the Bluffs. Board president Brian Donnelly updated members on several initiatives. One launched this year is the Lunch & Learn series, which included 11 luncheons this month on topics relevant to small businesses. Digital marketing, online safety and maker spaces have been among past topics. Donnelly encouraged members to share what they’d like hear or present. •Business After Hours, where businesses can showcase themselves. •Sparkplug Awards, which recognize community members and organizations. •Training session on emergency management preparedness in the workplace, attended by more than 100 people. •Question-and-answer session with Gov. Rick Snyder on economic issues in Michigan. “When’s the last time a sitting governor came up to talk to us about business in the Copper Country?” he said. New businesses were celebrated with seven ribbon-cuttings this year. In June, the Chamber also celebrated William Hodge Day, in honor of the philanthropist who left a large amount of money. After the Father’s Day flood, the chamber partnered with the Portage Health Foundation for the Still Strong Bluegrass Benefit Concert, which raised $14,000 for flood victim relief. Whitney Warstler, president for the Chamber, presented upcoming events. They include a gingerbread-making workshop (using graham crackers) on Dec. 15 at the Jutila Center. Leadership Keweenaw, last done in 2016, will be revived for next year. The course will include leadership in the community and personally. The Chamber will also take on a bigger role in BridgeFest next year, Warstler said. “Bridgefest is just a celebration of the community, and we think the chamber is a good organization to help with that,” she said. Chamber members also voted for new Board members. Five candidates ran for three general vacancies: Brad Barnett, Jill Passanisi, Penny Milkey, Todd Gast and Will Schuett. Jan Cole ran unopposed as Keweenaw County representative. The winners will be announced later this week.